here the spirit does not work with the hand, there is no art. And where the spirit does not work with the hands, the message is lost. 10. Jam miniature marshmallows up your nose and sneeze them out. See how many you can do at once. 9. Pop some popcorn without putting a lid on it. 8. When someone says, "Have a nice day! ", tell them you have other plans. 7. Make a list of things to do that you have already done. 6. Leaf through a National Geographic and draw underwear on the natives. 5. Read the dictionary upside down and look for secret messages. 4. Write a short story using alphabet soup. 3. Put your toddlers' clothes on backwards and send them off to preschool as if nothing were wrong. 2. Make up a language and ask people for directions. And the number one way to cope with stress is... Fill out your tax forms using Roman numerals. If this were your actual life, you would have received better instructions. n the topic of the difference between knowing two languages and interpreting between them, my mother grew up speaking Polish and continued to use it to speak to her mother who never become very fluent in English and to have secret conversations with her sisters. She wouldn't help me learn the language, which was disappointing. After I became an interpreter, she would always ask me how my teaching was going. I tried to describe the difference between teaching a deaf person and interpreting between a hearing teacher and a deaf student, but to no avail. When my mother developed Alzheimer's, I took her to Las Vegas (which I loathe, but she loves) and we were playing the machines. A woman came up to me and started to speak to me in what I thought was Russian, also gesturing that she was having trouble with her machine. Since Russian and Polish are relatively similar (my mother used to tell me that she could understand Krushchev when she heard his voice in the background of the voice-overs), I asked my mom if she could help the lady out. It turned out that the woman was actually speaking Polish. We called over someone who helps with the machines and my mother acted as interpreter. She did consecutive but you could see the mental strain of trying to figure out how to say it in the other language although she was fluent in both. When all was resolved I turned to my mother and said, "You know that interpreting you just did between English and Polish? That's the kind of thing I do with deaf people." Unfortuantely she couldn't remember what just happened. Oh well, two years too late! may nurse someone back to health, but that does not make me a nurse. I may doctor someone's wounds, but that does not make me a doctor... I interpret for my friend... does that make me an interpreter? It's a simple test designed to indicate whether people have too much stress in their life. 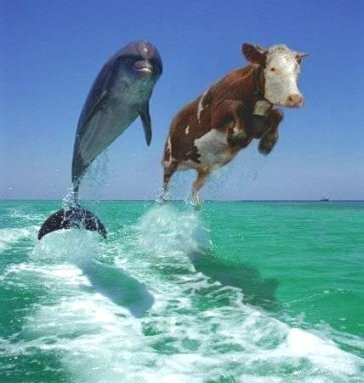 It's a picture of two dolphins. The two dolphins appear normal when viewed by a stress-free individual. This test is not accurate enough to pick up mild stress levels. It's quite simple. If there is anything that appears different about the dolphins (ignore the fact of the slight color differences) it is often an indication of potential stress related problems. Differences, if any, may also indicate the source of your stress. Sit upright and viewing the screen head-on, take a deep breath, breathe out and then open the picture and look directly at it. If there is anything out of the ordinary then you should consider taking things a little easier..
t's not the load that breaks you down - it's the way you carry it. The graduate with an Accounting degree asks, "How much does it cost?" The graduate with an Interpreting degree asks, "How can I best express that in the target language?" The graduate with a Liberal Arts degree asks, "Would you like mustard with that?" he illiterate of the 21st century will not be those who cannot read and write but those who cannot learn, unlearn, and relearn. "I curse the lesson and bless the knowledge." y cousin was teaching a beginning Sign class and got a sign going the wrong way. Instead of "early" she signed, "We were so excited about sign language class we arrived 'naked'". nly in quiet waters do things mirror themselves undistorted. ow to write a paper. 1. Sit in a straight, comfortable chair in a well-lit place with plenty of freshly sharpened pencils. 4. Stop off at another floor on the way back and visit with your friend from class. If your friend hasn't started the paper yet either, you can both walk to McDonald's and buy a hamburger to help you concentrate. If your friend shows you his paper, typed, double-spaced, and bound in one of those irritating see-thru plastic folders, drop him. 8. You know, you haven't written to that kid you met at camp since fourth grade. . . You'd better write that letter now and get it out of the way so you can concentrate. 10. Listen to one side of your favorite tape and that's it , I mean it, as soon as it's over you are going to start that paper. 14. Phone your friend on the other floor and ask if he's started writing yet. Exchange derogatory remarks about your teacher, the course, the university, the world at large. 15. Sit in a straight, comfortable chair in a clean, well lighted place with plenty of freshly sharpened pencils. 17. Check your e-mail to make sure no-one sent you any urgent messages since the last time you checked. 20. Phone your friend on the third floor to see if he was watching. Discuss the finer points of the plot. 24. Open your door and check to see if there are any mysterious, trench-coated strangers lurking in the hall. 25. Sit in a straight, comfortable chair in a clean, well lighted place with plenty of freshly sharpened pencils. he whole drift of my education goes to persuade me that the world of our present consciousness is only one out of many worlds of consciousness that exist. f you feel frustrated with your teachers, the following mental exercise may be of use. Picture yourself mentally near a stream. Birds are chirping in the crisp, mountain air. Nothing can bother you here. . .
You are in total seclusion from that place called the "world". The water is so clear . . .
that you can easily make out the face of the person whose head you are holding under the water. There now. . . feeling better??? t is the first of all problems for a man to find out what kind of work he is to do in this universe. Relatives that have been dead for years come visit you and suggest thatyou should get some rest. You keep yelling "STOP TOUCHING ME!!!" even though you are the only one in the room. David Lynch comes up to you and says: "Hey!, can I film you?" You have great revelations concerning: Life, the Universe, and Everything Else, but can't quite find the words for them before the white glow disappears, leaving you more confused than before. . .
You begin to talk to yourself, then disagree about the subject, get into a nasty row over it, lose, and refuse to speak to yourself for the rest of the night. Teddy bears begin to bully you for milk and cookies. You type the same sentence over and over again, not realizing that you have typed it before. . .
You type the same sentence over and over again, not realizing that you have typed it before. a part of the silence. We all know that hand gestures can spice up a story or punctuate an idea. But now it appears that waving hands and pointing fingers may actually make our speech more articulate, too. Columbia University psychologist Robert Krauss, Ph. D., videotaped 41 students as they described action-packed excerpts from Road Runner cartoons. Half of the students were allowed to move their hands while talking, while the rest were permitted to use only words. The gestures, it turned out, were more eloquent in recounting the coyote's foibles, at least when explaining spatial relationship between objects or characters -- for example, "The coyote is perched on a rock." They also spoke more quickly, were less likely to repeat themselves, and emitted fewer "ers" and "ums." The reason, suggests Krauss, is that gestures act as a mental bridge between spatial concepts and words, making it easier for us to think of the right phrase quickly. While the study may shed light on speech disorders, it's also a potent reminder that communicating is a full body affair. - Haley, H. (March/April 1997). Let�your fingers�do the talking.�Psychology Today, 24.
rom what we get, we can make a living; what we give, however, makes a life. y husband is learning sign from me and we communicate any way we can think of. About three months ago he wanted to let me know he had put some chicken on to boil. He and I both did not know how to sign but he signed to me this way he acted like a chicken then he grabbed his leg then made a rolling motion with his hands. This was really quite funny to see but he got the message across to me. hat we hope ever to do with ease, we must learn first to do with diligence. You Know You're Drinking Too Much Coffee When. . .
* You're the employee of the month at a coffeehouse and you don't even work there. * You can type sixty words per minute. . . with your feet. * You buy 1/2 & 1/2 by the barrel. * Your three favorite things in life are. . .coffee before, coffee during and coffee after. et us so live that when we come to die even the undertaker will be sorry. t won't be too long before you will have to be writing resumes and cover letters. Let's hope you can to better than these real examples taken from resumes and cover letters. The spelling is exactly the way it appeared in the original documents. 14. "I am loyal to my employer at all costs... Please feel free to respond to my resume on my office voice mail." 16. "My goal is to be a meteorologist. But since I possess no training in meteorology, I suppose I should try stock brokerage." 22. "Note: Please don't misconstrue my 14 jobs as 'job-hopping'. I have never quit a job."